New arrival, and just now discovering some of the previously hidden views in this garden forum! We're in the middle of a full-on home renovation on our little cape, and I've unilaterally decided to renew the yard & gardens as well. 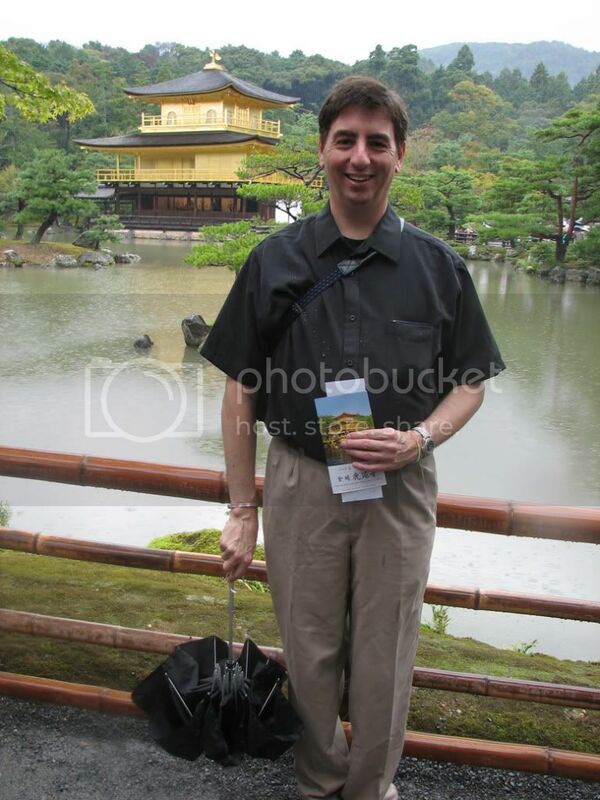 My inspiration came last October, with the gift of a trip to Kyoto, where our little group spent (too little!) time in a couple of lovely gardens and parks. I've collected a few stones - big as I can carry, so not gigantic, and am looking for more. I've collected quite a bit of living material, mostly plants of Japanese origin (hinoki and sarawa falsecypress, Acer palmatums, Aucubas, mondo grass) or which are used there extensively (Liriopes, Hydrangeas, azaleas, Rhododendrons) - and some that just seem to me to fit the aesthetic (Junipers, Leucothe, mugo pine, Fargesia bamboos, wintergreen). As soon as the workers are done in various areas of the yard, I'm planning to dig some holes and fill them with beauty, but right now, everything's just parked 'round the old goldfish pond. (It's too shallow for wintering koi...) I've got a plan all drawn out on a piece of paper and probably more enthusiasm than sense, LOL! Anyway, I'm quite looking forward to exploring things 'round here, learning lots, perhaps sharing some photos along the way, and meeting some folks who find just as much beauty in stone, water and greenery as I do! Bruce, welcome to the forum! Boy do you have a wonderful journey before you! Welcome, Bruce. It's always nice to see a new member with such enthusiasm! I'm sure I do, Don! I love to learn stuff though, so that works out. The enthusiasm definitely helps, Susan! You just never where you're going to end up, riding its tide . . .
Bruce welcome to the forum, I do not have Koi but to winter over my gold fish I use a pond heater. I place it near my pump and keep my waterfall running for circulation. Works quite well hear in zone 5. Just a thought. I'm not too far north of you here in Southern NH. I look forward to seeing your project develop. I have that same picture... but with me in the foreground. June - Goldfish overwinter in my pond better than they do in a tank around here, LOL - I expect they'll be fine. This year, they've been joined by a group of mosquitofish, and there are also quite a few new young bullfrogs! John - It's a pretty cool spot for a photo, isn't it? I miss that place so much I just had to try & recreate a bit of it here. My wife is disabled. 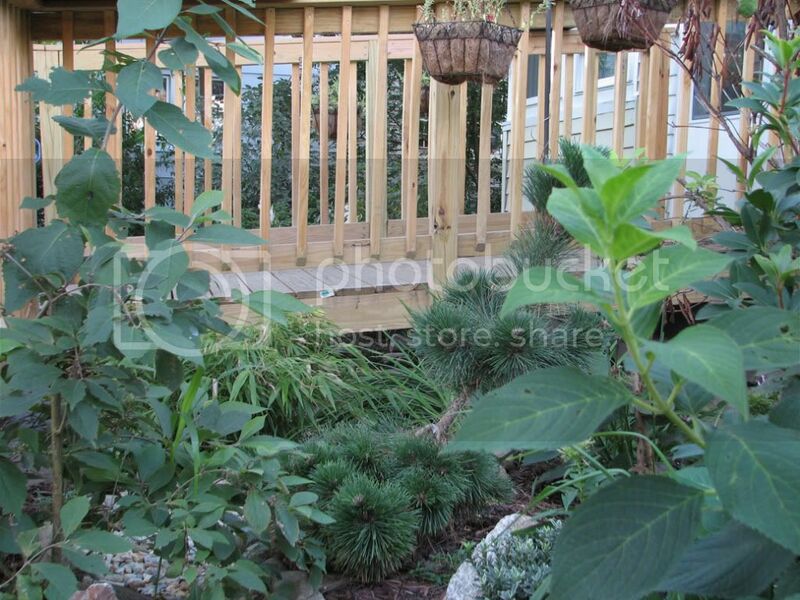 Inside the right angle of the new access ramp, Pinus thunbergii 'thunderhead', Chinese beautyberry 'profusion', and Fargesia rufa line a dry riverbed. Looking back toward the ramp, you'll see a couple sawara falsecypress, 'gold mops' and 'baby blue', heuchera 'caramel' and hosta 'praying hands', along with hydrangea 'twist & shout', Aucuba, creeping juniper 'nana' and a clump of hakone grass which are not in this photo. 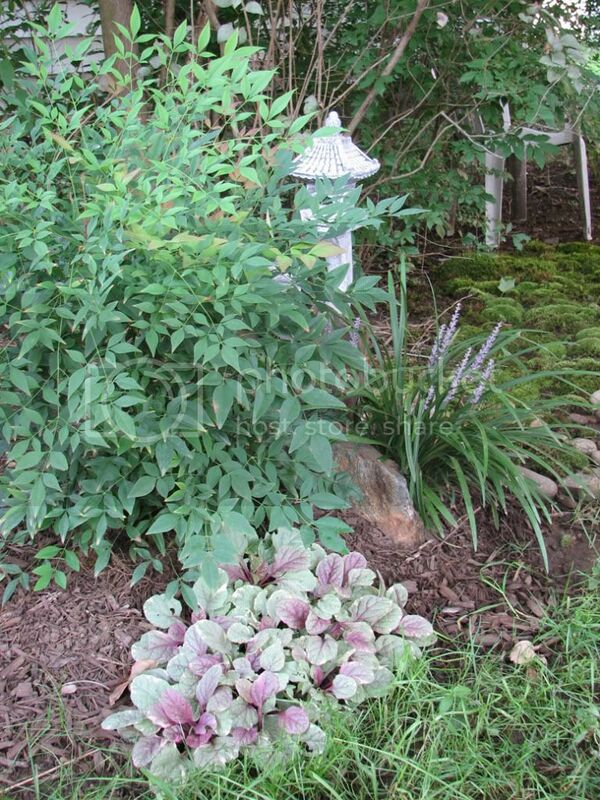 Nandina, Ajuga 'raspberry glow' and liriope form a small group alongside a dogwood tree. 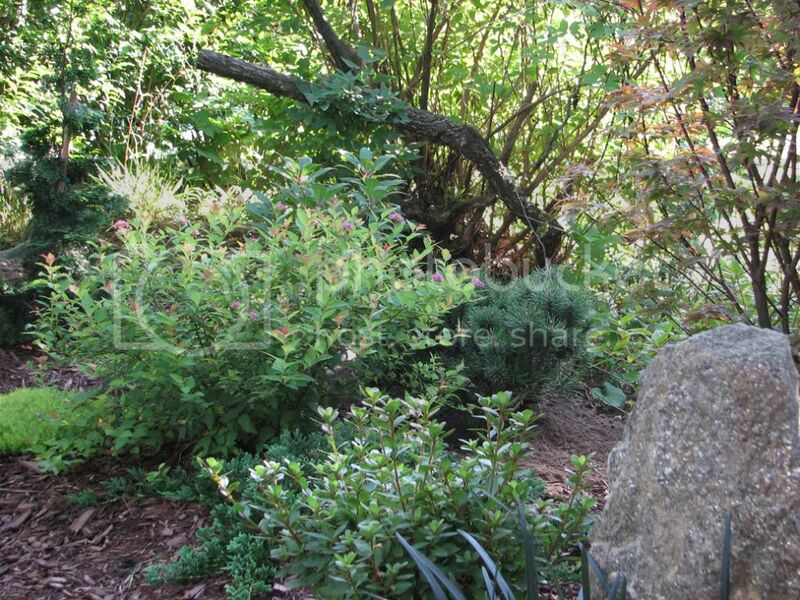 Hinoki cultivars 'gracilis', 'gold fernspray' and 'tempelhof' back heucheras, hostas and a 'silver sword' azalea, as well as a small yukimi and guardian stone. A closer look. I would have loved to use some larger stones, but all the stones were collected locally, so couldn't be larger than I could lift and carry. (I carried this one about three quarters of a mile!) The patch of lichen on its side seems to be surviving, if not thriving. Nearby - Hinoki 'gracilis', Spirea japonica 'magic carpet', mugo pine 'pumilio', Hydrangea paniculata 'pinky winky', and Acer palmatum 'pixie' are visible - there are also azaleas in the colors of the Japanese national flag in this patch, as well as a Pieris 'blazing silver', Scotch and Irish moss (not a true moss, but a flowering plant with a mossy texture) a heuchera and a liriope. Here, and in several other places, stones have been made to appear larger than they are by setting them upright. 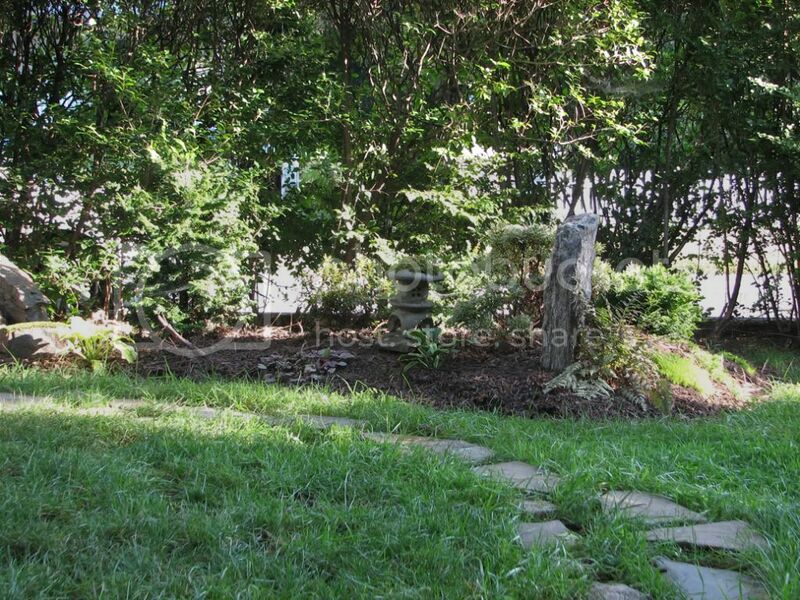 That's about it for the front yard of a small suburban home - let's move toward the side yard, which is not visible from here, but hinted at by the continuing stone path . . . 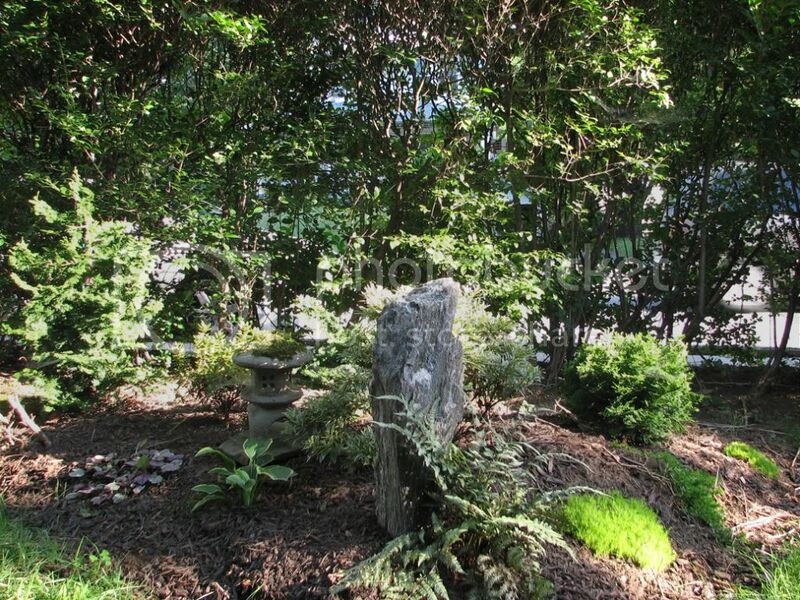 Here, there are hostas, heucheras, azaleas (both tsutsuji and satsuki types) and ferns of several types, yakushimanum rhododendrons, Tricyrtis, . . .
Acontium, Acer palmatum 'waterfall', Japanese primrose, wintergreen, hellebores, yews (existing) and a few other goodies to entertain you as you walk up and down this tiny hill, passing solar lanterns on your way to . 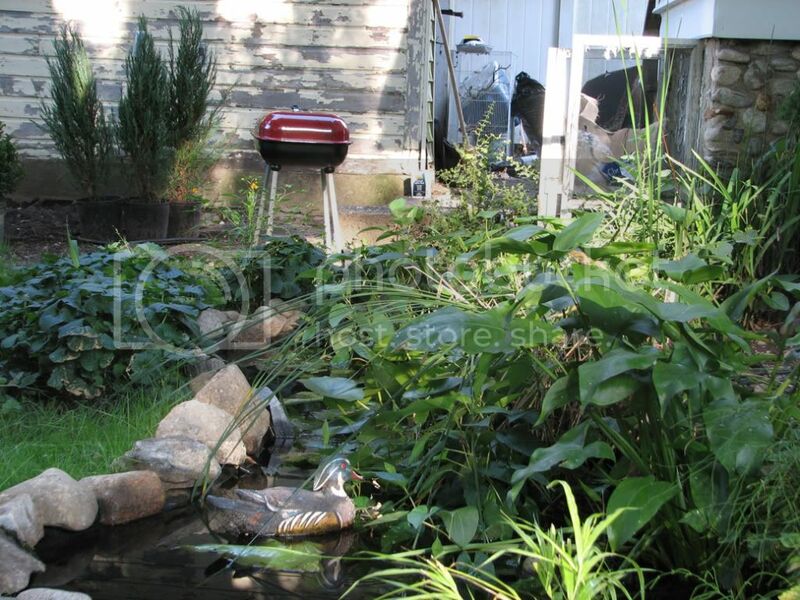 . .
the quite un-finished back yard and the pond. Hope you've enjoyed it, as far as it's come - I know I have! I also strongly suspect that I'm going to go through quite a few sets of pruning shears over the next few . 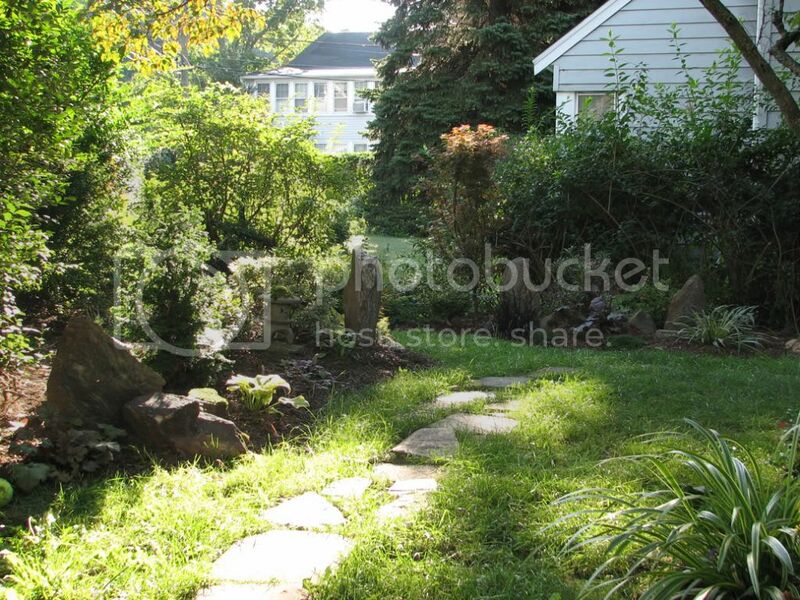 . .
Bruce glad to hear you are enjoying your garden, thanks for sharing your photos. From my own experience I notice you have some plants fairly close together. I have had to move plants because I have not left enough room between them. 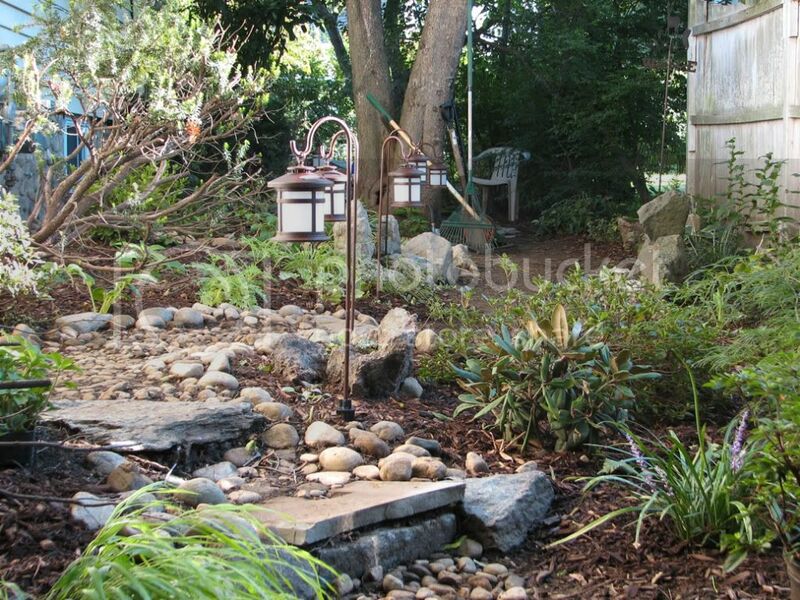 Example, in photo seven, the grouping to the left of the boulder it appears the plantings look a little tight. Open spaces between plants tend to let you see the shape of the individual plants and we need to remember what size the plant will become as it matures. 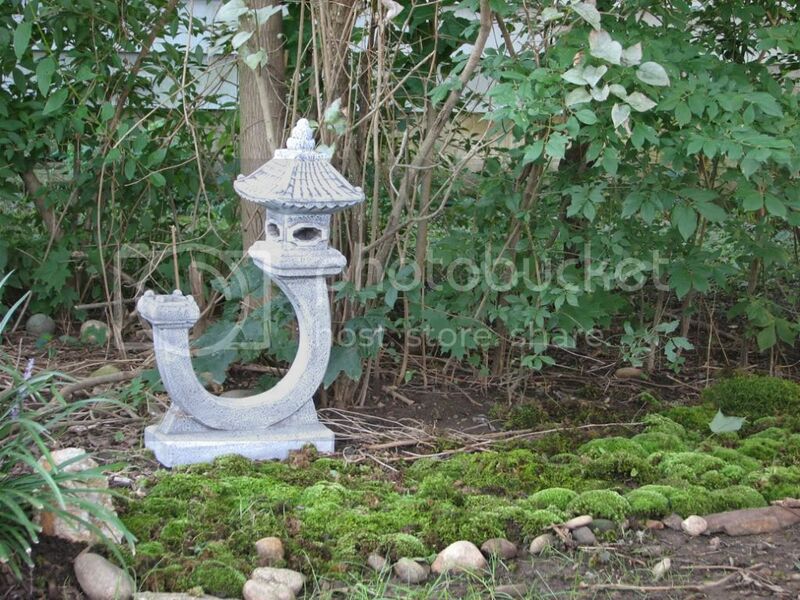 I also have never seen a lantern in that shape, does anyone know the origin of this type of lantern. And Bruce you are young, be careful now with your back trying to carry that size of boulder, when you get to be my age you may pay dearly for it. Thanks again for sharing your garden. Photo seven - I see what you mean. The good news is that you're looking sort of along the length of that bed, so the plants look a lot closer together than they really are. (I do suspect that there'll be some collisions and decisions in coming years, though...) The two plants there that _are_ closer than I had planned are the spirea and mugo. 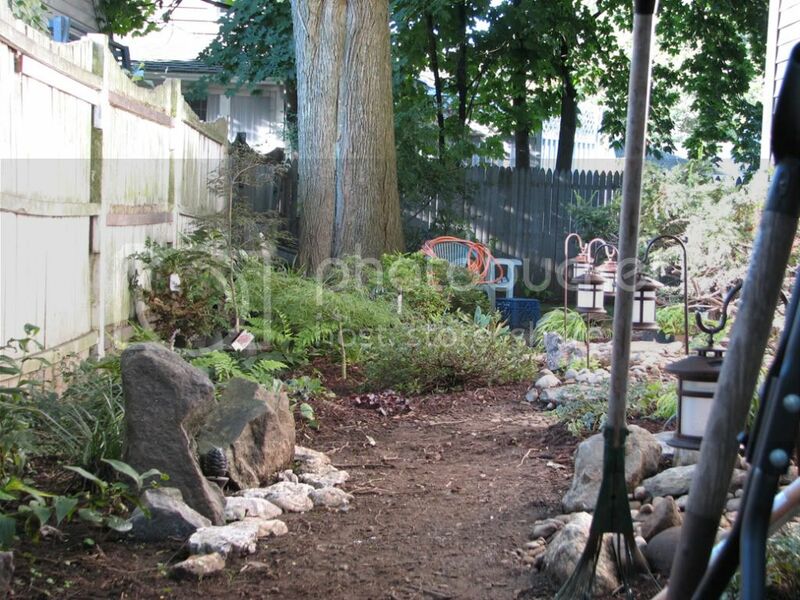 The plan was for the bright, light greens, coppery new growth and pink blooms of the spirea to playfully dance in front of the more somber greens of the pine. I think the spirea will need some trimming in time, to allow the pine to rise above it a bit. I will admit to having gone a bit insane at the local nurseries this spring & summer . 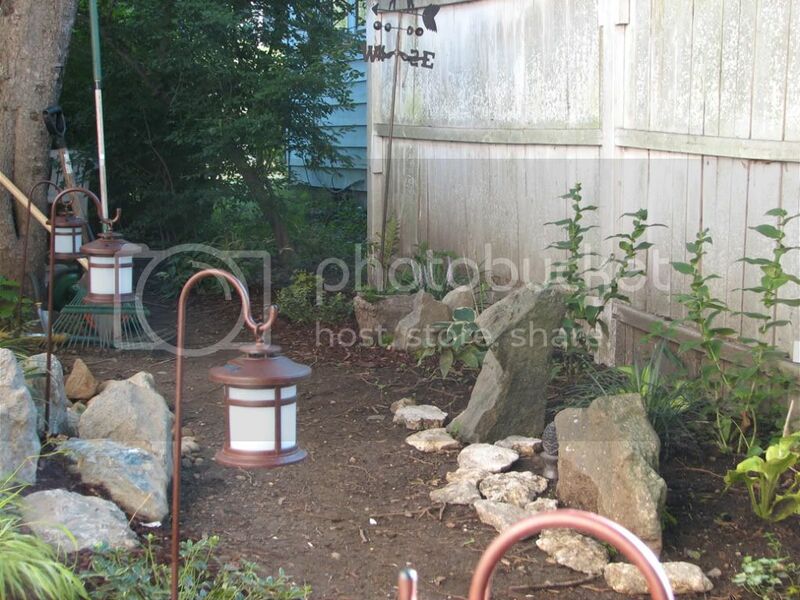 . .
That lantern may be a western approximation - the smaller riser is a holder for a pillar type candle. I may not be quite as young as I look - and I do feel it after horsing stones around! Most of the stones are lighter than they look, as a great many of them are platelike, as flat as tombstones. I've only a few more to set, but of course, they're the heaviest of the lot! Bruce, to further make my point about spacing click on the green world ball under Jando. That will take you to my web site with photos of the garden when I first put it in and you can see how far apart some of my plants were when first planted. In under 10 years they are now almost as close as yours are planted to begin with. My mugo pines are pruned every year but are still 3 to 4 times larger than their original size and look better now with the pruned shape. 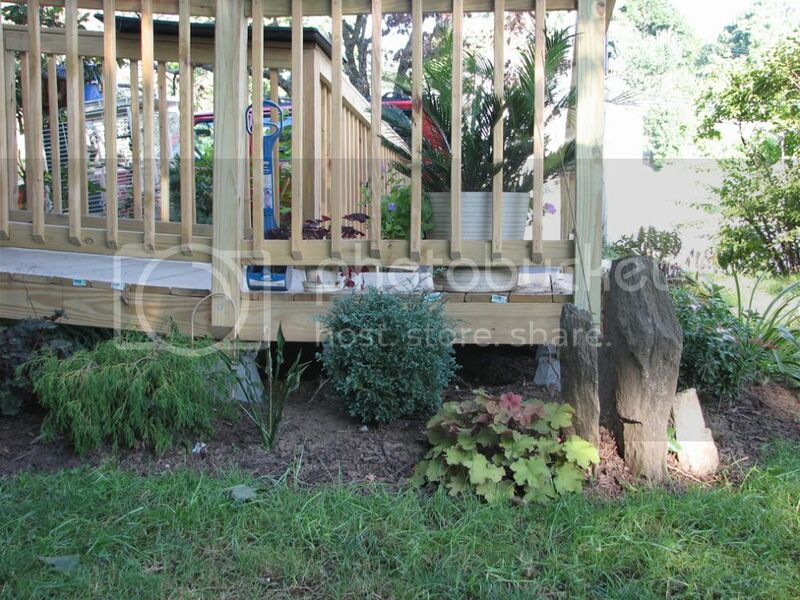 I'm trying to help you now when it is easiest on your plants to move them and give them more space. Over time you can shape them and see the individual plant for its beauty and shape. It is hard to visualize how fast our gardens start to mature. I dont want to interrupt your conversations, but you should now move into the main forum and discuss these things within the topics there. With 10k posts, we need to categorize! Thanks.